From large and chunky to small and ornate, stacked bangles are a must-have spring fashion trend. Throw on a favorite pair of jean shorts along with a classic plain t-shirt and load one wrist up with a couple of bracelets that are different sizes, textures and materials. 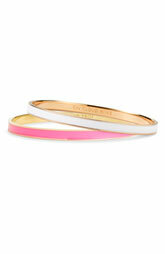 Colorful bangles are especially in this spring season and who does color better than Kate Spade. Her signature Idiom bangles are perfect for wearing to any occasion. The light gold-plated and enamel bangles are very chic. Starting at $28 dollars each, buying more than one can get a little pricey.